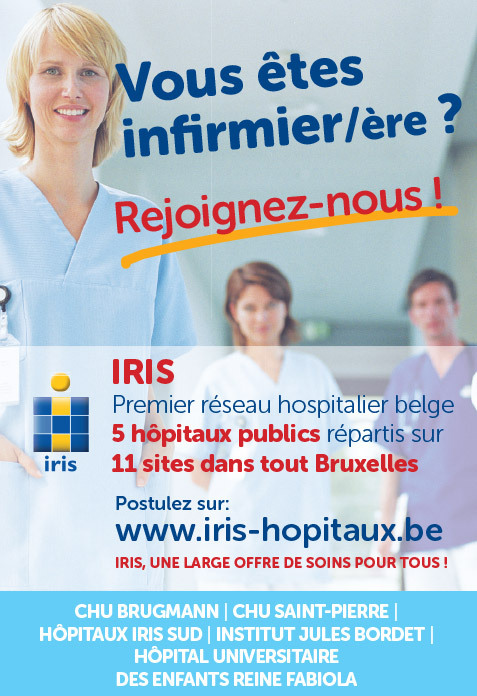 Embedded in the heart of neighbourhoods in the Brussels Region, iris is the most important hospital network in Belgium, and is intent above all on being close to each and every one of you. Supported by six municipalities and by the Brussels-Capital Region, our network comprises 5 public hospitals (Brugmann University Hospital, Saint-Pierre University Hospital, Iris South Hospitals, QFCUH, and the Jules Bordet Institute), located on 11 different sites. iris is a network of local hospitals with a very comprehensive healthcare, capable of treating nearly all diseases. Iris is the country’s largest emergency service. It accounts for more than a million medical consultations per year. Iris is also the leading maternity ward in Brussels, where very many children come into this world. A bilingual network, French- and Dutch-speaking, Iris is in keeping with the international and multicultural character of our Capital, by working in a dozen other languages on a regular basis. Our mission in Iris is to attend to every patient without discrimination. The medical, nursing and administrative staff welcome all patients, without distinction as to their social situation, nationality, origin, state of health, religion or philosophy. Our hospitals are in the service of one and all, at all moments of their existence, from cradle to grave, and irrespective of their medical problems. In partnership with the ULB (French-speaking Free University of Brussels) and the VUB (Dutch-speaking Free University of Brussels), we also take an active part in training student doctors, nurses and other future care providers. Our network also invests in the best care technologies, and conducts extensive scientific research so as to stay at the forefront of medical progress at all times. Today the IRIS network comprises nearly 10,000 employees who are attentive to you and your health every day and every night.